and a perfect time to network and market your business. 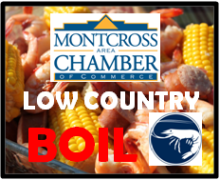 The first annual MACC Low Country Boil last September was one of the most fun and delicious events of the year, and the second annual promises to be even better. Creative Solutions Special Events and Saltwater Market are presenting sponsors. Creative Solutions is providing the venue and Saltwater Market is providing the food. More sponsorships and details will be announced soon. Reservations at $30 each sold out last year, so get yours early. Registration link above.